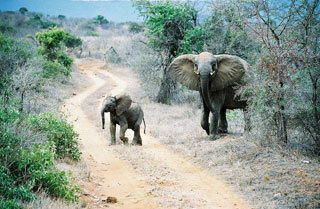 Tsavo National Park is one of the oldest and largest parks in Kenya. Situated in a semi-arid area previously known as the Taru Desert it opened in April 1948. Over 500 bird species have been recorded in the area, including ostriches, kestrels, buzzards, starlings, weaver birds, kingfishers, hornbills, secretary birds and herons. This article uses material from the Wikipedia article "Tsavo National Park", which is released under the Creative Commons Attribution-Share-Alike 3.0 License.